Get ready Uxbridge, there are new players coming to town! 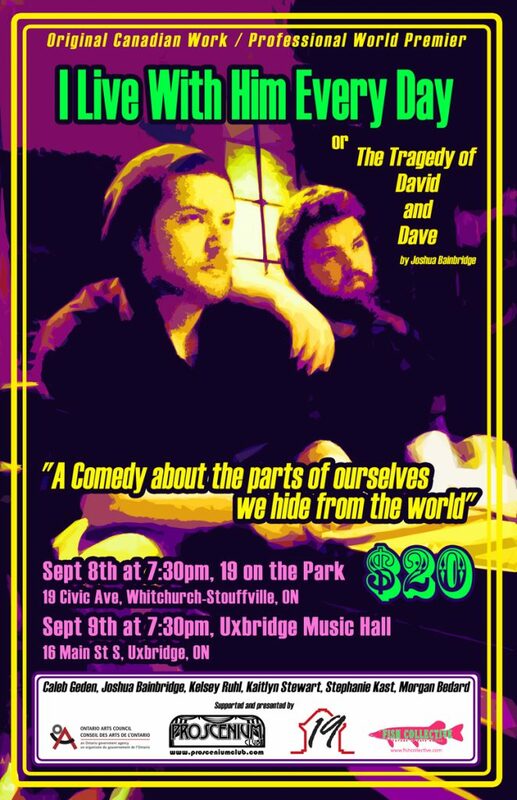 Northern Ontario’s newest theatre troupe, the Proscenium Club, will present their inaugural production I Live With Him Every Day or The Tragedy of David and Dave Friday, August 9 at 7:30 pm at the Uxbridge Music Hall. Written and directed by Joshua Bainbridge, I Live With Him Every Day explores the truth we are all afraid of realizing; that we might not be special. It examines the lives of five young people struggling to live in a world in which parents are absent and friends make desperate efforts to fill the gap. With a fresh, contemporary voice, this dark comedy is an edgy portrayal of youth lost and adrift in the big city. Although this is the first play staged by the newly formed Proscenium Club, its members have been working in the Northern theatre scene for the past few years. Bainbridge, who founded the troupe just this summer, has been writing and producing his own works since 2010 after graduating from Canadore College’s Theatre Arts program. Seeing a shortage of new theatrical works emerging from Northern Ontario, he brought together several passionate like-minded artists to form a self-sufficient professional theatre company to create and produce new Canadian works. The presentation at the Uxbridge Music Hall is the second stop on the Proscenium Club’s inaugural tour. I Live With Him Every Day premieres on Thursday, August 8 at 7:30pm at 19 on the Park in Stouffville. Tickets for both performances are $20 plus any applicable fees and taxes charged by the venues. This small professional tour is being conducted in collaboration with the Future In Safe Hands (FISH) Collective (www.fishcollective.com), a cross-cultural multi-arts collective of Indigenous and non-Indigenous artists operating out of the North Bay area. For more information or to purchase tickets, please contact 19 on the Park (www.nineteenonthepark.com), located at 19 Civic Avenue, Stouffville (905-640-2322) or the Uxbridge Music Hall (www.uxbridgemusichall.com), located at 16 Main Street South in Uxbridge (905) 852-3081. You can also find out more at www.prosceniumclub.com.